1976 – the drought year! That was when I first went to the Lake District. I’d like to say I’ve been back every year since, but it would be a total whopper. 2018 was the next time I went back. Yes, this year. We’d stayed in the Dales and popped over to Windermere for the day. I really thought it was time to go back and have a look around! A couple of years ago I was having a bit of a mooch running with a few guys including Jacqui Byrne and she said she was running Skiddaw. I had a look at it online – 42 miles in the Lakes looked good – and tucked it in my head . So, it ate away and after the Windermere visit this year, it ate a bit more until June when I couldn’t take it any more. It was a bit of a risk as it was sandwiched between The Plague and Cotswold Century but I somehow thought they could all dovetail. It won’t go down as one of my best ideas. Besides, what was I going to do for training – the highest point in Oxfordshire is 261m, hill training at its best. 6 weeks ago, I tore my calf, so no running. 3 weeks later I slogged through the Plague picking up the inevitable niggles and didn’t run for another three weeks – Grand Tour of Skiddaw weekend. The whole family and another family were supposed to be heading up for a weekend in the Lakes, but somehow I found myself alone driving up the heavily congested M6. I’d hoped to get there with a bit of daylight, but watched the sunset around 8pm as I turned off at Junction 42. A few country lanes and thankfully the satnav took me to Lime House School Race HQ and campsite. I parked in a field where I was to camp, and went straight to registration and received a very friendly reception, collected my number, dibber, vest, tracker and Mountain Fuel gel. And pins, don’t forget the pins. I was pretty tired after the drive so wanted to get my tent up and crash. I bumped into Nici as I came out of the sports hall registration. I don’t know how she recognised me in the dark, but she said it was my beaming smile. Such wit. I think it was around 6am when Guy Garvey woke me up telling me to throw my curtains wide – I was in a tent, I didn’t have any. It was, however, looking like a beautiful day. Nice and warm too. I munched on some flapjack I’d made with added chia seeds for breakfast, got my stuff together and pins, where are my pins? I went back for more. I didn’t know where to put my tracker either and was told it would be okay to tuck it into my upper running vest pocket. I stood around until race brief where I was told the route was approximately 44 miles (eh? !, thought it was 42) and then we had around 10 minutes to kill and as I was standing next to the mobile canteen, I thought it would be rude not to take advantage of some freshly ground coffee. Double espresso done and it was time to race. I say race. We were told if we wanted to race we’d have to get up front as there was a kissing gate not far away and would cause a bottleneck. I stayed where I was in my usual spot. And off we went. And then stopped. It was for around 5 minutes but it was nice to have the rest… There were quite a few kissing gates on this section so whilst the field of runners spread out, they also bunched at the kissing gates. I got a bit frustrated with this and tried the run ahead of others to get to the next gate before you technique. It was the first mistake of many in the day – – the majority of the field would be passing me on the way back. It was nice to see Nici, Sharon and Jacqui at a road crossing as they were helping out with marshalling duties – there were others, I just don’t know their names. I pootled on over the sparkling new Bell Bridge which had been trashed by Storm Desmond in 2015. There was some nice pottering along here and I was feeling a bit excited about the views opening out. I must have been daydreaming a bit here because I went flying. I was blatantly tripped by some root, bramble or twig – I don’t know which one as they were all grinning and not owning up. I really don’t like that sort of thing, hanging around in woods doing nothing but photosynthesising. Go get a job, like oxygenating the planet. I jogged on with a flesh wound of pride. The first checkpoint was in Caldbeck and Nici and Sharon were there post-road-crossing detail and were now on dibbing detail. The Byrne was sat on a wall cheering runners on. I went inside and filled my bottles up, ate some peanuts and a banana. And so to my second mistake of the day – I didn’t bother drinking any water because I couldn’t be bothered to take my cup out of my vest. You can’t make it up. Well I was going to pay for that before long. ..and then started downward. I was getting thirsty already and saw a marshal at a refuge – Lingy Hut – and he said when we got to a sign we should turn left. It was a really good downhill bit – by Grainsgill Beck. Head down there and turn right.. I really enjoyed it, going as fast as I could, which compared to a fell runner would have been risible, but it felt good. There was a sign at the bottom about a mine but I didn’t stop and then turned right onto some very runnable terrain. It should have been runnable anyway. I got a mile or two along and then simply crashed. I was done already. Out of water and praying for an aid station. I hadn’t checked where they were so had no idea when one would come along. What about those houses up there? Nope, that’s Skiddaw House. Nothing doing. I remembered I had a nakd bar and ate that. I’m not sure whether the bar started to kick in or a change in terrain snapped me out of my slump. The path went upwards and onto a bit of a ledge looking ahead towards St Johns in the Vale (I think). It was beautiful to see a bit of valley and hill with clouds and sunshine coming out across part of it. Stunning stuff. I headed round towards my right and Keswick and Derwent water came into view. Then I saw what I hoped was an aid station (thankfully it was – Latrigg). It took a bit of time to get there and I saw some runners coming back towards me. I asked them why they were coming back and they pointed over my shoulder. I looked around and there, disappearing up to the clouds was Skiddaw. I was suitably impressed. I got my cup out this time and let it overfloweth to slake my thirst type thing. And there was meat and potato pie! I’ve never fuelled up on that before and wasn’t sure about it, but carbs, fat and salt can’t be all bad on a run. A few salty crisps too and I was ready for storming the Skiddaw – let the ascent begin. There’s a Simpsons episode where Homer is supposed to be climbing the Murderhorn and he’s been through about 3 oxygen bottles. The scene pans back and it shows he’s just set off only marginally above Marge. That was me. Again, my uphill skills and all that training in the white horse vale were paying dividends with embarrassing riches. A family of sloths on holiday from the Amazon rainforest walked by chatting away. Followed by some other slow animals that I can’t remember the names of. It was great though, looking back over Keswick – the traditional start of the Bob Graham Round at the Moot Hall steps. The views eventually disappeared as I went into the cloud. There were plenty of tourists doing the climb as well. 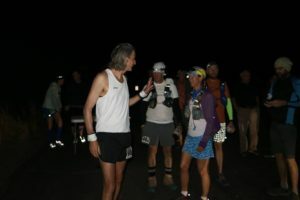 I’d been chatting with Jacqui’s friend, Sharon D on the race and she was ahead of me going up but it was levelling off and I managed to catch her up with a bit of running and we had a bit of a chat. There’s a bell that the race organisers put on the trig point and I was desperately listening out for it as a guide that we’d be near to the top. I couldn’t hear it. There seemed to be even more tourists coming down now and I was desperate to ask them if it was far to the top but there was little point, it wouldn’t come any sooner whatever they said. We’d started going upwards again and Sharon forged ahead out of sight. I was following the cairns in the mist on my own. It was Sharon. She’d got a bit disoriented in the cloud but she was heading the right way, we walked together and soon came across a couple of marshals. How they hadn’t frozen to death I don’t know – despite warm weather clothing. They said it wasn’t far and sure enough it wasn’t. We rang the bell and thus began our tour of campanology. Some young lads were sheltering by a cairn and asked us if we wanted any sausage roll for some reason. Very kind, but I declined. I wanted to get under the cloud as I knew I’d get cold soon if I stayed, so we headed back to the marshals we’d seen before. It’s down there, they said. It was great! Steep scree, I didn’t know how to go at it. I’d read about the brakes off, brain off theory but there were people coming up as well. I did the best I could. Legend fell runner Billy Bland had described how the only time he’d got injured going off Skiddaw was when he was a bit older and tried braking a bit too much. I’d say I flew down because it felt like it, and I overtook quite a few people, but looking on Strava it wasn’t very fast. I got to a bit that levelled out and there was a photographer there for the race. I simply asked him if he could make me look like a runner. The path went upwards a bit and I thought I’d try my new cola caffeine gel. “Don’t worry about stomach issues, always try new gels at the top of a mountain in the middle of a race” suggested no one ever, but then I don’t think meat and potato pies are on Kilian Jornet’s nutritional agenda either. Another welcome downhill bit ensued, and stunning views when I dared to look up. 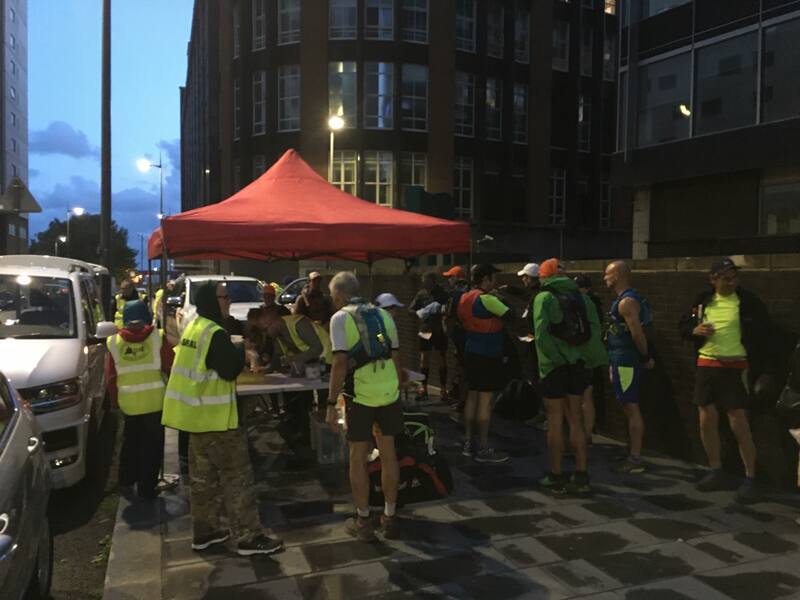 I got to the bottom and chatted to a few runners – NDW50 man and walking pole girl. I needed to take a quick pitstop and went behind a wall. What came out was orange. Evil orange. I was seriously dehydrated. I don’t remember too much about the next bit, just bimbling along, occasionally chatting with the odd runner or two and then the aid station at Peter House Farm came up with welcome relief. There was a car coming along the road we were heading up and we moved to get out of the way, but it pulled over. Who got out of the car? – None other than my niece Sam! What an amazing and welcome surprise. I knew she was tracking me and lived not too far away in Penrith, but I hadn’t expected her to turn up. I was joyous. I had a fight with some wasps over some cheese and pickle sandwiches and had a chat with Sam and she’d said she thought I’d dropped as my tracker had stopped working. I was a bit annoyed about this as I knew my family was keeping track of me and they’re good fun to watch, (I watch them myself as well). One of the marshals had a bit of tape and now taped my tracker to the more exposed shoulder part of my running vest and it did eventually work again. Not sure what happened with it. Sadly had to say goodbye to Sam but she said she’d be at the finish. I was then travelling through a field and there were a couple of guys I spoke to and asked if the race was actually 44 miles, more or less? Eh!? I initially thought it was 42, then it was 44 and now it’s 46? Where did the 4 bonus miles come from. I spat my dummy out. I was running along now trying not to trip up, but it wasn’t roots or branches this time, it was my lower lip. I was shot in this race around the 10 mile mark, I didn’t want to do any more than I needed! I was glad I knew now though, rather than finding out at mile 44 that I hadn’t finished! The two guys ran off but I overheard them saying that the rest of the route was mostly rolling countryside with a few pulls every now and then. (The “pulls” were steep up bits that didn’t last too long). 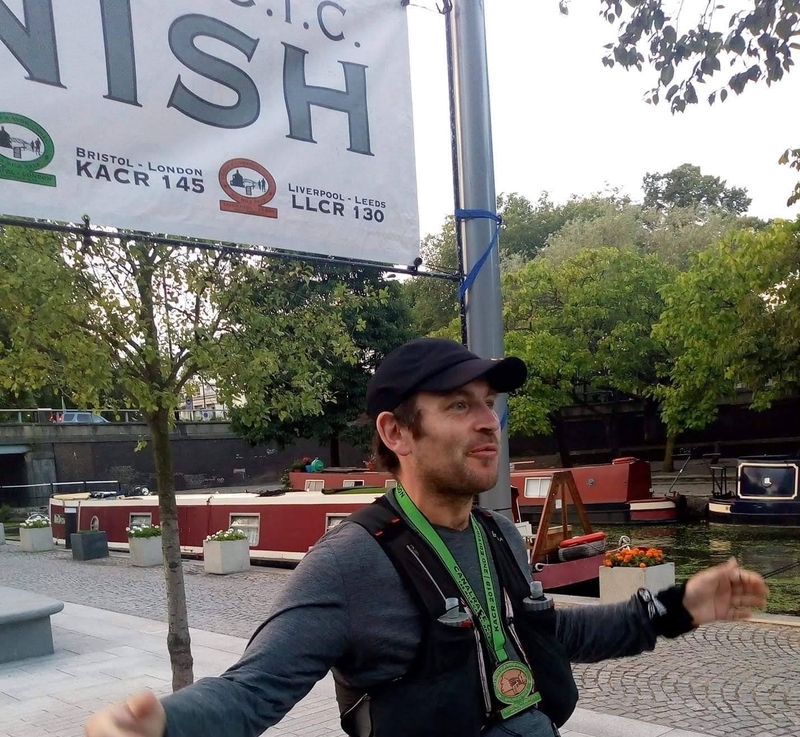 For a fair bit of this part of the race I found I was running on my own, l would look around and no one was there and then people would appear from nowhere and pass me. Was I going backwards or what? I was following the route markers and up until now I hadn’t taken a wrong turn but now, by a farm with the road going ahead, was an arrowed sign that was leaning to the right – was it right or straight on? Absolutely no idea which way to go. What’s that Richard, you didn’t bring your course notes? Well, I printed them off, they’re in the car. Well, you’ve got a compass, surely you brought a map then? There was a GPS download on the Pure Outdoors Events website. Goes without saying, you uploaded that onto that expensive device on your wrist. Ah. I mainly use that for daily step counting….Oooh look, there’s a guardian angel disguised as a runner – Bright Orange Top Lady. I know she’s an angel as she has a gps system around her neck and is telling me that the direction to go is along the road. And I was thankful for a bit of road running if I’m honest. I sort of followed Bright Orange Top Lady for some considerable time as other runners caught us up or we caught runners up. The road was now exacerbating the grit and pebbles in my shoes and it felt like sandpaper rubbing away. I resolved to stop and found an ideal place against an open barred fence thing on a bridge over a brook. In hindsight it wasn’t wise because if I dropped my shoe, then I’d have had to play Salomon pooh sticks and leg it after a disappearing shoe as it meandered down the stream. Shoes emptied (although there’s always one bit of grit that hangs on for dear life), I felt a bit more comfortable. We left the road and I was talking to a chap with a Liverpudlian sounding accent for a while, then I pushed on a bit and caught BOTL up. I thanked her profusely as I’d hung on to her coat tails a fair bit. She looked at her gps and said we were on Caldbeck common. And then we got to the corner of a field wall and she said that that was it, we’d done the loop so we were now heading back the 10 miles we’d come out on. Then she disappeared! It was pretty flowing downhill though and I ran as much as I could towards Caldbeck. Reaching Caldbeck I suddenly dropped again. Absolutely wiped out. I knew the aid station was close, but I reached out for another bar to eat. I was still eating it when Nici’s dulcet tones shouted at me to get a move on. The Byrne was still perched on the wall – although she denied it, I could have sworn she’d sat there all day. I went inside the hall and decided I’d shovel as much food in my face as possible – no more energy slumps. Soup and lots of cheese and pickle sandwiches. Cup of tea. Coke. Absolutely fantastic. People came and went but I’d stopped caring. Eventually I got up and decided to finish. 7-8 miles to go along the riverside. Hopefully those nasty bits of nature had moved on by now as well. Off I went. Bloated and feeling sick from all the food I’d eaten. So I had to go slowly and let it settle a bit. I was good at going slow anyway, so all was well. I pushed on and stopped, as I’d done a lot of times this race, to take in the surroundings and take a photo or two. There was a wide bit of river at one point and I was almost expecting a kingfisher or dipper to fly along, but sadly it wasn’t to be. I was so banjaxed by now that I kept stopping at gates and rested my head on them and I was blowing away. I was heading through a field when a farmer pulled up on a quad bike. For a fleeting moment I thought he was another angel and was going to offer me a lift. Sadly this wasn’t the case, he just asked me about how many runners I thought were left. Over Bell Bridge and off the road again. I decided to take one last gel, no point in taking it for a 40 odd mile walk and it might just help me get to the finish. I looked behind me and there was another runner the other side of a field. I wasn’t going to be overtaken again so I started to run and resolved not to stop again – which I didn’t until I got to the final field full of cows. Dammit. I’m not overly afraid of cows, but have a healthy respect of them having witnessed (first-hand) them charging rather too close for comfort. Thankfully, they weren’t interested so I got through them and the kissing gate without event. Just a little run along to the finish and Sam was there to cheer me on. I couldn’t make out if she wanted to hug me or not, but she just told me to hurry up and finish so that’s what we did. The same lady that was on registration the night before dibbed my finish and said hello again. She took my tracker and dibber and got me a coffee. There was a makeshift bar in the sports hall – the Stagger Inn – and I sat down with Sam with my slate finishers medal. I did my best to talk but was feeling out of it. Sam was brilliant and got me a pizza. And a second pizza. And coffee. We chatted for a while and I agreed to meet up with her the next day for lunch. Some showers never have hot water. I don’t believe these ones had any cold. They’d been turned up to Fires of Hell heat. Absolutely marvellous. I would love to have had a drink in the bar afterwards but was so shot that my tent was calling. I wasn’t falling asleep any time soon as I was aching and full of adrenaline and feeling happy with the world. And there was loud music playing and huge whooping going on as other runners came in to finish. It was a great sound to hear and I just lay there in agony but felt good. After my shower the previous evening, I’d put my watch in a bag. My phone had run out of battery as well. So, when I heard cars leaving in the morning from the camp site and zippers going in tents, I thought it must be time to get up. I got out of the tent to be greeted to another balmy day (no music this time) but no one was about. I put my phone in the car to charge and it was only 7am. I went to the sports hall to have a look around and Jacqui was there having a cup of tea so I decided to have one. Sharon D joined us too and we had a bit of a chat. We were waiting for later because Billy Bland was coming to give awards out and have a bit of a chat and Q&A. There was also a light stretching session which Gaynor – the RD – was taking. So the morning went by, the stretching was much needed and then we sat outside for a bit. Mr Bland turned up with cake made by Mrs Bland who was also there for a while. We then went back in for the presentations and Gaynor gave a bit of a washdown on the race. There’d been over 500 arrow markers put out. And a bunch of idiots that had either moved them or taken them down. Why? Who knows – it had sent a couple of the front runners the wrong way but luckily the crew were on it quickly to correct everything. I think there were 140 starters with only one drop – someone who was ill, so sensible decision. That’s a fantastic finish rate. Course records, third time win in a row in the ladies (who’d also had a storming LL100 earlier this year) and the third place male had run a half marathon that morning in 1.20 for a 4th place finish! Billy Bland then gave out the awards and then had a chat about his running and, of course, Kilian Jornet who had recently taken his long-standing (36 years I think) record for the Bob Graham Round. He mentioned being buggered a lot and had also mentioned that Kilian too looked buggered at the end of the BGR. I had to laugh at the thought of Kilian picking up this expression then going on to to win the UTMB (sadly he didn’t), then being interviewed on Eurosport – so Kilian, how do you feel? – buggered. Not standing still, Mr Bland then got changed into his cycling gear to ride his bike back home. I’m not a fan of selfies and don’t care for celebrities, but I did ask for a photo with this fell running legend. What a guy. I drove slowly back to the M6 trying to take in as much of the scenery as possible, then headed to Penrith for chilli made by Sam. It was great to see her again and have a bit of a chat before heading back home on a much quieter M6 than when I came up. So, how did I feel after the event? Buggered obviously! But I felt appreciation, awe, bewilderment – for both the scenery and the runners. I slogged up Skiddaw, but these guys raced up it. The Bob Graham Round STARTS at Skiddaw then takes in a further 41 fells – all within 24 hours. Billy Bland’s 36 year record was 13.52 and only beaten this year by Kilian Jornet in 12.52. I took nearly 12 hours just to get round this course! My 42 mile race length supposition came from me not looking properly at the Skiddaw race page. I’m not sure how the approximate 44 mile turned into 46 though, but this is NOT a complaint at the RD – they must be utterly sick of Garmin/Suunto Johnnies moaning about bonus mileage (and taped seems for that matter). I confess, I hadn’t looked at the map properly to work out aid station distances. I got my water and food badly, badly wrong. I paid for it plenty too, with quite dramatic energy crashes. I’d been complacent about the route as I knew it was fully waymarked. To not have downloaded the GPS was real indolence on my part. Pacing was just ragged. If I may make a plea – I’ve never done anything like this before – well, sort of half of it on Man vs Mountain, but it doesn’t compare. Having chided myself, what were the good bits? It was utterly amazing. I loved it. Value for money as well. Helpful marshals from start to finish, good food, beautiful route and a fantastic introduction to the Lakes. Generous cut offs if you don’t want to rush, but some fantastic runners at the pointy end if you want to race. The runners that I talked to on the course and the next day over breakfast were great company and really friendly. Gaynor clearly knew her stuff and put on a great event and it was fantastic to see and meet a running legend at the end. Can’t fault it. Top marks! Huge thank you to Gaynor for putting on a great show and the stretching session the next day was a great touch. Billy Bland for showing up and giving us a few anecdotes. Mrs Ann Bland for bringing chocolate cake. Nici, Sharon and all the marshals whose names I don’t know, for their friendliness and helpfulness, you made the race run smooth as clockwork. The friendly people I met. The Lake District. For being utterly stunning. Oooh, and the weather. Damn near perfect. Jacqui for pointing me in the direction of the Lake District. Finally, Sam. Thank you so much for turning up at the aid station and for pampering a whimpering mess at the end. And for the chilli the day after. To the Lake District. I waited 42 years to see you again. Let’s not leave it so long next time!